The latest craze finally hit the Isle of Man in 2014, thanks to the owner of BubbleBall, Francis. He and his team have been at Onchan Pleasure Park all summer with plans afoot to occupy an area of the new marquee at Tynwald Mills in St Johns. 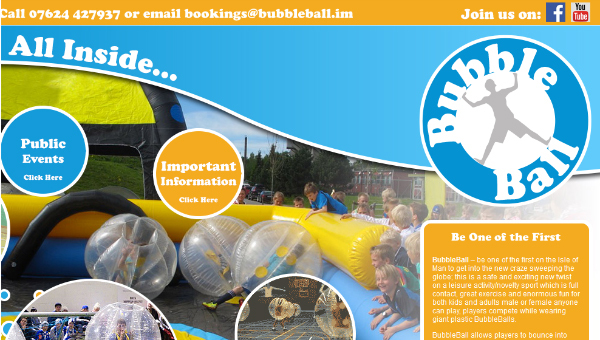 BubbleBall is available for private hire for kids and big kids alike! We created all material for BubbleBall including the logo and the adventurous website to Francis’ spec, which was that he didn’t want one the same as everyone else! We also created the social media profiles and artwork before handing the whole lot over to be maneged in-house. Services: Logo, Design, Web, Hosting.